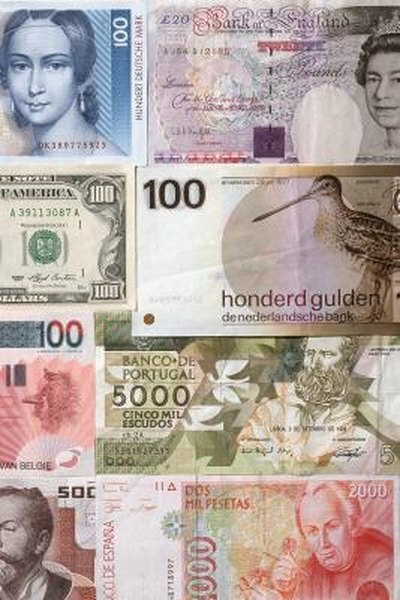 Charting currency movements is a basic skill for forex investors. One of the most commonly used tools of technical analysis is the bar chart. When it is interpreted correctly, this simple symbol can be used to show turning points, trend lines and support and resistance levels. While bar charts are not absolute in their ability to predict currency movements, they provide you with an important tool to better understand market movements. A bar chart is composed of vertical bars that show a currency's trading range for whatever period you are analyzing -- hour, day, week or month. The bars rise and fall according to the economic pressures that affect the supply and demand for a currency. The top of each bar indicates the highest price for the currency during that period, while the bottom shows the lowest end of the range. A small tick on the left side of the bar indicates the opening price of the currency, while a tick on the right side marks the closing price. Some charting models use colors to show whether the currency rose or fell in that trading period. Typically, black bars indicate a rising price, while red indicates a decline. Chart analysis is based on the principle that currencies trade in recurring and predictable patterns. You can identify a trend visually, but currency prices will zig and zag somewhat. To identify an ascending trend more precisely, you need to be able to connect at least three rising peaks in a straight line. If you see falling prices, you can identify a down trend by plotting a line that connects three or more descending lows. Spotting the end of a trend is important because that will signal a buying or selling opportunity. There are two patterns that mark reversals, with tops and bottoms being the inverse of each other. At the peak of an ascending trend, one reversal pattern is called a double peak. Picture the form like a letter M. The currency price rises, falls back and then rises to the previous high before falling back again, which begins a downward trend. Another pattern is the head and shoulders top. In this pattern, the currency price rises, retreats, rises to a higher level, retreats and rises to the level of the first high before beginning a downtrend. A reversal at the end of a down trend is just the opposite. The M is now a W, and the head and shoulders pattern is inverted. Resistance is a price level that a currency has trouble breaking through on an upward trend, while support is a price that a declining stock does not cross. You can see both resistance and support in a bar chart where a currency cannot seem to break through a ceiling (resistance) or bounces off a floor (support). Depending on your position in a currency trade, these price levels could be buy or sell signals. Before you invest real money, practice with paper trades until you are confident with your charting.